Churches are fascinating places to my eyes, particularly when empty. When a building that is designed to house a group of people with a common purpose is stripped of those people, even temporarily, it is like removing the leaves from a tree or the clothes from a body; the elegance of the lines and bones that were there all along becomes more easily seen. 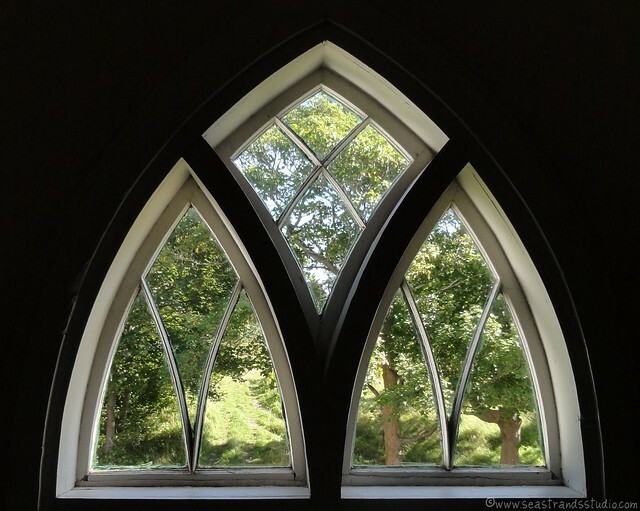 I particularly like windows in churches because the admission of light is one of the most fundamental of religious symbols ingrained in religious buildings, as the architects and builders of Gothic cathedrals proved beyond measure. Taken on September 19, 2010, 2011, with a Sony DSC-HX5V. Exposed for exterior, focus set on frame. Sacred Heart Church, Tors Cove, Newfoundland. While my personal preference is for windows that tell stories (a throw-back to my particular interest in medieval literacy and the communication of ideas through means literary and visual), I also appreciate ones that simply let in light and scenery. Particularly windows like the one below, in the bell-tower of the church. 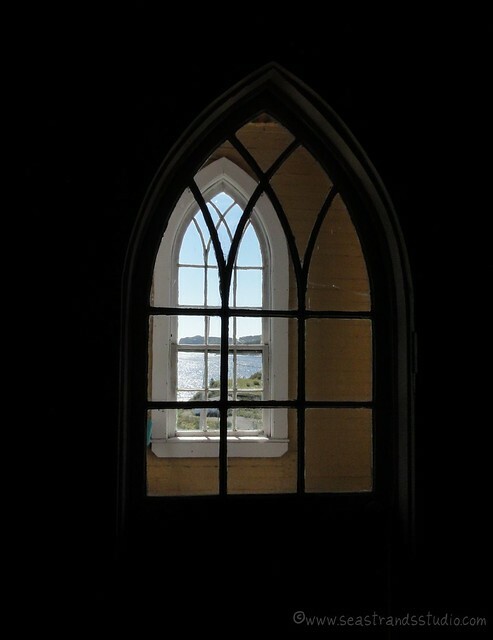 Historically, churches in Newfoundland were rarely locked (an exception being in the case of attack, be it by English or French). Churches were a place of sanctuary, open to all who needed to enter and guarded and cared for by the whole community. Folks wouldn’t dream of desecrating a church or of stealing from one. On the rare occasion in which it happened historically, apprehending the perpetrator was not difficult. After all, this was an island without roads. Where would you go? Add to that the fact that small communities in Newfoundland are no different from small communities the world over; everything you do is noticed by someone. It is rare now to find a church that is unlocked without someone inside, but this one was and it gave me a little feeling of pleasure that in some places the decency of humanity is a default assumption and that this building was open to visitors. Next Post Bell Island – a place for many adventures.